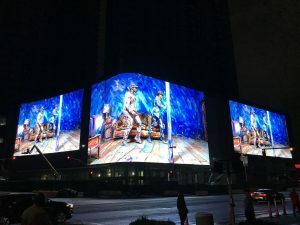 Giant LED Screens from SNA Displays and Support by Christie Terra Series Stop Traffic in L.A.
L.A. luxury residential towers near Staples Center have become Hollywood stars since grand opening, thanks to three Christie Terra giant LED screens. The new Circa development in downtown Los Angeles is a certified traffic-stopper. Then again, traffic in and around L.A. traditionally doesn’t move all that quickly. The twin 35-story luxury residential towers on the corner of Figueroa and 12th Streets are wrapped with three giant LED screens covering an eight-story parking structure used by patrons of the adjacent L.A. Live and STAPLES Center. While LED screens of similar size have been seen in Times Square, the Circa screens mark the debut of the LED display “spectacular” market in L.A.
Circa’s screens comprise more than 18,000 square feet of exterior LEDs from SNA Displays; the convex and concave design of the screens mirrors the unique curvature of Circa’s architecture. The displays feature a 10mm pixel pitch and contains more than 17 million pixels. 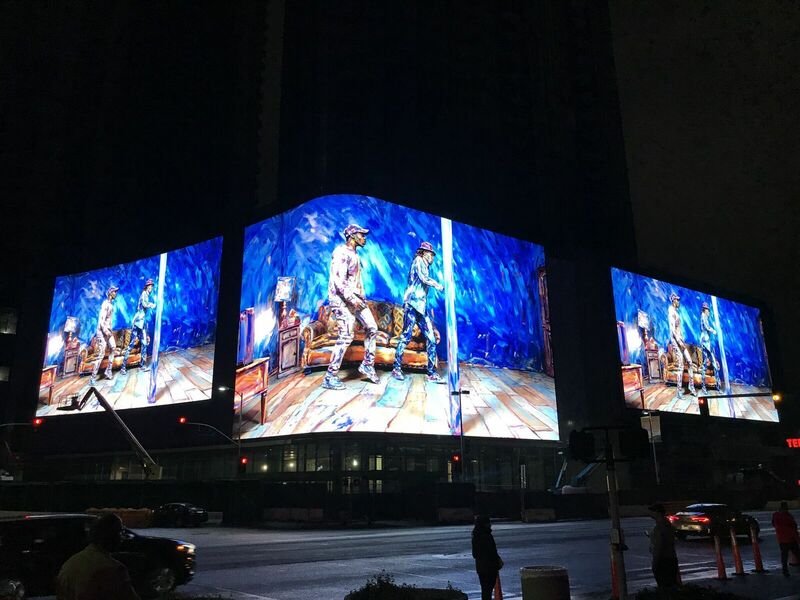 The Circa giant LED screens went live with a NIKE commercial featuring tennis legend Serena Williams, but they’re intended to generate more than advertising revenue. The screens are designed to create visual excitement and energize downtown LA’s South Park District. SNA Displays chose Christie Terra as the switching, scaling and signal extension solution for the LEDs’ 4K content. Terra consists of a lineup of transmitters, receivers and a controller, including 4K@60Hz video formats over 10G Ethernet networks. Built on standardized SDVoE (Software Defined Video over Ethernet) technology, Christie Terra includes zero-frame latency, artifact-free video over 10G components. StandardVision, LLC, which operates the display, can do a live shoot on the street and see it in real-time on the LED screens with no delay, says Ives. The Circa screens use a Terra transmitter and Terra receiver for each of the three giant LED screens plus one Terra controller for the system. The control room is located four floors up from the content distribution room on the lower level of the parking deck. Utility 1G network ports on the Terra receivers are also being used to supply local control connections. This avoids the need for another network cable to be run to each endpoint. Terra also offers flexible control of the displays from other than the centralized location. “We can display one event and quickly switch to another event,” says Pat Green, senior director of systems at SNA Displays. “It’s easy to do. 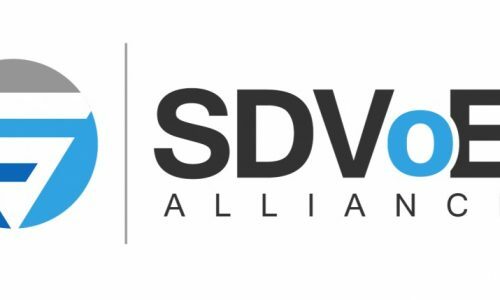 “SDVoE’s standardized infrastructure and 10G Ethernet is part of our road map. Although the Circa giant LED screens are displaying only 4K content now, Terra will be accepting of other displays and networks natively as time goes by,” he says. The Circa development is symbolic of downtown L.A.’s resurgence. With concerts, conventions and other venues in the area, the neighborhood around Circa draws more than six million visitors annually. YESCO partnered with SNA Displays for fabrication and installation of all secondary steel structural components along with the installation and integration of the electronics for all digital assets.